Pressure treated wood is a popular product for outdoor construction, i.e. bridges and decks. The chemicals (including chromated copper arsenate – CCA) that were used to treat wood in the U.S. and perhaps other countries were revised in recent years to remove at least some of the potentially harmful properties. The new formulations did help with the environmental risks, but they caused new problems for construction. When wood treated with the new chemicals was exposed to metal parts, the metal tended to corrode, even moreso in water contact environments, in only a few years. The pressure treatments I’m talking about are alkaline copper quaternary (ACQ) and copper azole (CA), which are both active corrosion materials. So, the experts started recommending using galvanized steel or stainless steel for any metal parts, i.e. connector plates, joist hangars, and fasteners, that came into contact with pressure treated wood. Galvanized steel or stainless steel would withstand the chemicals for a while. So at least, the corrosion rate would be slowed down. In my experience in remodeling, and specifically rebuilding decks, I found that some structures that had used ACQ or CA showed exactly how corrosive the treatments were. 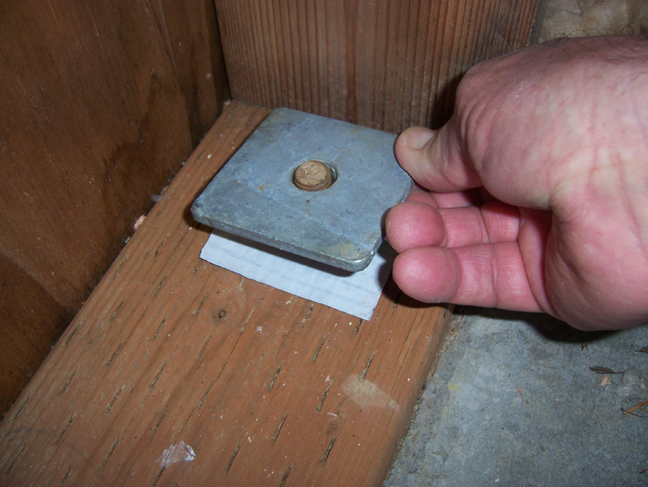 Galvanized steel joist hangers were nearly destroyed in only a few years. I had this concern in mind when I built my suspension bridge. The cable locking system parts are hot-dip galvanized steel. But I also added a padding-wrap made of a bituminous material to add more protection between them and the painted (another layer of protection) pressure-treated beams that supported the bridge. Maybe I over-did it a little, but I like the things that I build to outlive me. In building our new house, I ran into the problem again. 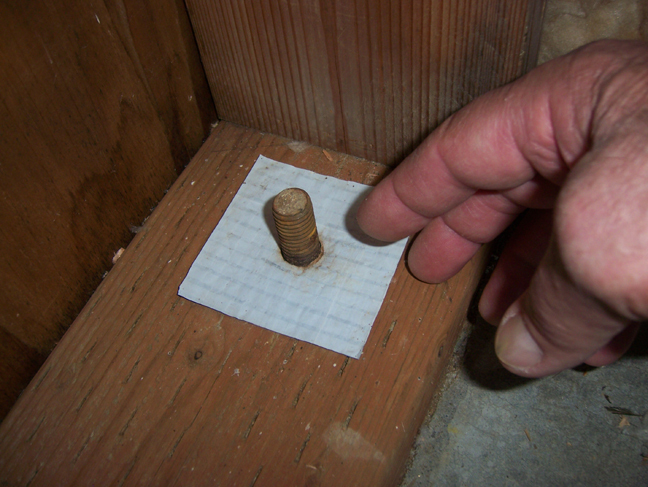 In Oregon (and I’m guessing other states in the U.S.) it is required to install foundation anchor bolts in the stem wall foundation. These are to tie the house to the foundation. 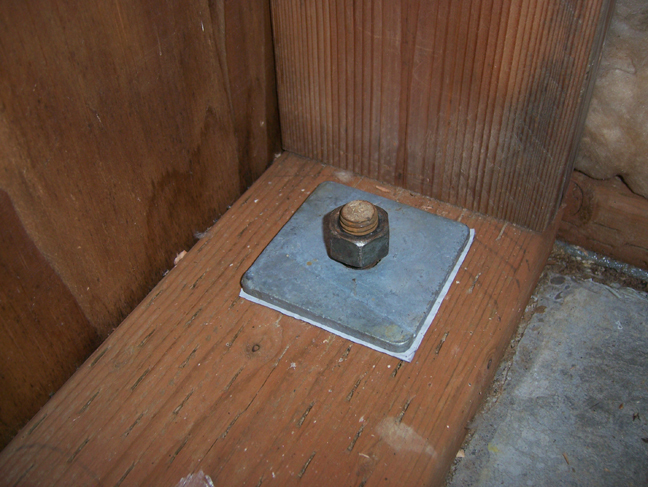 The bolts go through the pressure treated wooden plates and are secured with nuts. I had the issue again of metal making contact with pressure treated wood. I used ungalvanized (standard, but oversized to 5/8″ vs 1/2″ bolts) because I’m not convinced simple galvanization is the answer anyway. 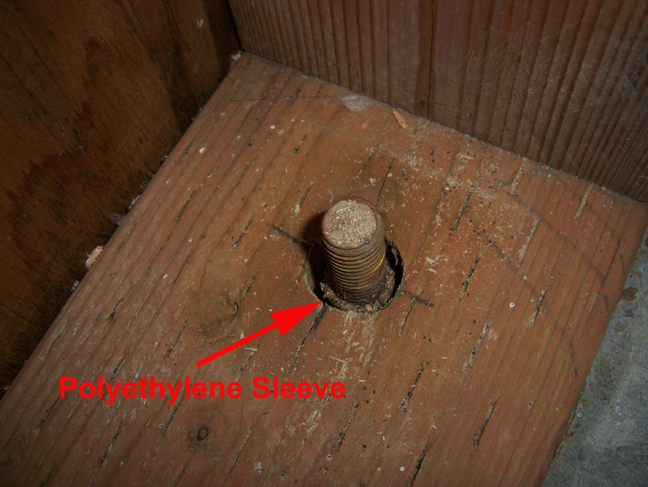 I opted to protect the bolts with a sleeve that I made from polyethylene tubing (5/8″ interior) material. before adding the galvanized steel plate. At the completion all metal was completely isolated from the treated wood.